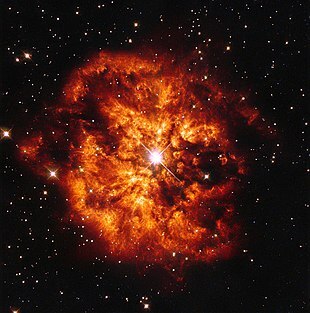 Hubble Space Telescope image of nebula M1-67 around Wolf–Rayet star WR 124. Wolf–Rayet stars, often abbreviated as WR stars, are a rare heterogeneous set of stars with unusual spectra showing prominent broad emission lines of ionised helium and highly ionised nitrogen or carbon. The spectra indicate very high surface enhancement of heavy elements, depletion of hydrogen, and strong stellar winds. Their surface temperatures range from 30,000 K to around 200,000 K, hotter than almost all other stars. Classic (or Population I) Wolf–Rayet stars are evolved, massive stars that have completely lost their outer hydrogen and are fusing helium or heavier elements in the core. A subset of the population I WR stars show hydrogen lines in their spectra and are known as WNh stars; they are young extremely massive stars still fusing hydrogen at the core, with helium and nitrogen exposed at the surface by strong mixing and radiation-driven mass loss. A separate group of stars with WR spectra are the central stars of planetary nebulae (CSPNe), post asymptotic giant branch stars that were similar to the Sun while on the main sequence, but have now ceased fusion and shed their atmospheres to reveal a bare carbon-oxygen core. All Wolf–Rayet stars are highly luminous objects due to their high temperatures—thousands of times the bolometric luminosity of the Sun (L☉) for the CSPNe, hundreds of thousands L☉ for the Population I WR stars, to over a million L☉ for the WNh stars—although not exceptionally bright visually since most of their radiation output is in the ultraviolet. The naked-eye stars Gamma Velorum and Theta Muscae, as well as the most massive known star, R136a1 in 30 Doradus, are all Wolf–Rayet stars. In 1867, using the 40 cm Foucault telescope at the Paris Observatory, astronomers Charles Wolf and Georges Rayet discovered three stars in the constellation Cygnus (HD 191765, HD 192103 and HD 192641, now designated as WR 134, WR 135, and WR 137 respectively) that displayed broad emission bands on an otherwise continuous spectrum. Most stars only display absorption lines or bands in their spectra, as a result of overlying elements absorbing light energy at specific frequencies, so these were clearly unusual objects. The nature of the emission bands in the spectra of a Wolf–Rayet star remained a mystery for several decades. Edward C. Pickering theorized that the lines were caused by an unusual state of hydrogen, and it was found that this "Pickering series" of lines followed a pattern similar to the Balmer series, when half-integer quantum numbers were substituted. It was later shown that the lines resulted from the presence of helium; a chemical element that was discovered in 1868. Pickering noted similarities between Wolf–Rayet spectra and nebular spectra, and this similarity led to the conclusion that some or all Wolf Rayet stars were the central stars of planetary nebulae. By 1929, the width of the emission bands was being attributed to Doppler broadening, and hence that the gas surrounding these stars must be moving with velocities of 300–2400 km/s along the line of sight. The conclusion was that a Wolf–Rayet star is continually ejecting gas into space, producing an expanding envelope of nebulous gas. The force ejecting the gas at the high velocities observed is radiation pressure. It was well known that many stars with Wolf Rayet type spectra were the central stars of planetary nebulae, but also that many were not associated with an obvious planetary nebula or any visible nebulosity at all. In addition to helium, emission lines of carbon, oxygen and nitrogen were identified in the spectra of Wolf–Rayet stars. In 1938, the International Astronomical Union classified the spectra of Wolf–Rayet stars into types WN and WC, depending on whether the spectrum was dominated by lines of nitrogen or carbon-oxygen respectively. In 1969, several CSPNe with strong OVI emissions lines were grouped under a new "OVI sequence", or just OVI type. These were subsequently referred to as [WO] stars. Similar stars not associated with planetary nebulae were described shortly after and the WO classification was eventually also adopted for population I WR stars. The understanding that certain late, and sometimes not-so-late, WN stars with hydrogen lines in their spectra are at a different stage of evolution from hydrogen-free WR stars has led to the introduction of the term WNh to distinguish these stars generally from other WN stars. They were previously referred to as WNL stars, although there are late-type WN stars without hydrogen as well as WR stars with hydrogen as early as WN5. Spectrum of WR 137, a WC7 star and one of the three original WR stars (horizontal axis : wavelength in Å). Wolf–Rayet stars were named on the basis of the strong broad emission lines in their spectra, identified with helium, nitrogen, carbon, silicon, and oxygen, but with hydrogen lines usually weak or absent. The first system of classification split these into stars with dominant lines of ionised nitrogen (NIII, NIV, and NV) and those with dominant lines of ionised carbon (CIII and CIV) and sometimes oxygen (OIII - OVI), referred to as WN and WC respectively. The two classes WN and WC were further split into temperature sequences WN5-WN8 and WC6-WC8 based on the relative strengths of the 541.1nm HeII and 587.5 nm HeI lines. Wolf–Rayet emission lines frequently have a broadened absorption wing (P Cygni profile) suggesting circumstellar material. A WO sequence has also been separated from the WC sequence for even hotter stars where emission of ionised oxygen dominates that of ionised carbon, although the actual proportions of those elements in the stars are likely to be comparable. WC and WO spectra are formally distinguished based on the presence or absence of CIII emission. WC spectra also generally lack the OVI lines that are strong in WO spectra. The WN spectral sequence was expanded to include WN2 - WN9, and the definitions refined based on the relative strengths of the NIII lines at 463.4-464.1 nm and 531.4 nm, the NIV lines at 347.9-348.4 nm and 405.8 nm, and the NV lines at 460.3 nm, 461.9 nm, and 493.3-494.4 nm. These lines are well separated from areas of strong and variable He emission and the line strengths are well correlated with temperature. Stars with spectra intermediate between WN and Ofpe have been classified as WN10 and WN11 although this nomenclature is not universally accepted. The type WN1 was proposed for stars with neither NIV nor NV lines, to accommodate Brey 1 and Brey 66 which appeared to be intermediate between WN2 and WN2.5. The relative line strengths and widths for each WN sub-class were later quantified, and the ratio between the 541.1 nm HeII and 587.5m, HeI lines was introduced as the primary indicator of the ionisation level and hence of the spectral sub-class. The need for WN1 disappeared and both Brey 1 and Brey 66 are now classified as WN3b. The somewhat obscure WN2.5 and WN4.5 classes were dropped. The WC spectral sequence was expanded to include WC4 - WC11, although some older papers have also used WC1 - WC3. The primary emission lines used to distinguish the WC sub-types are CII 426.7 nm, CIII at 569.6 nm, CIII/IV465.0 nm, CIV at 580.1-581.2 nm, and the OV (and OIII) blend at 557.2-559.8 nm. The sequence was extended to include WC10 and WC11, and the subclass criteria were quantified based primarily on the relative strengths of carbon lines to rely on ionisation factors even if there were abundance variations between carbon and oxygen. For WO-type stars the main lines used are CIV at 580.1 nm, OIV at 340.0 nm, OV (and OIII) blend at 557.2-559.8 nm, OVI at 381.1-383.4 nm, OVII at 567.0 nm, and OVIII at 606.8 nm. The sequence was expanded to include WO5 and quantified based the relative strengths of the OVI/CIV and OVI/OV lines. A later scheme, designed for consistency across classical WR stars and CSPNe, returned to the WO1 to WO4 sequence and adjusted the divisions. d for dust (occasionally vd, pd, or ed for variable, periodic, or episodic dust). The classification of Wolf Rayet spectra is complicated by the frequent association of the stars with dense nebulosity, dust clouds, or binary companions. A suffix of "+OB" is used to indicate the presence of absorption lines in the spectrum likely to be associated with a more normal companion star, or "+abs" for absorption lines with an unknown origin. The hotter WR spectral sub-classes are described as early and the cooler ones as late, consistent with other spectral types. WNE and WCE refer to early type spectra while WNL and WCL refer to late type spectra, with the dividing line approximately at sub-class six or seven. There is no such thing as a late WO-type star. There is a strong tendency for WNE stars to be hydrogen-poor while the spectra of WNL stars frequently include hydrogen lines. Spectral types for the central stars of planetary nebulae are qualified by surrounding them with square brackets (e.g. [WC4]). They are almost all of the WC sequence with the known [WO] stars representing the hot extension of the carbon sequence. There are also a small number of [WN] and [WC/WN] types, only discovered quite recently. Their formation mechanism is as yet unclear. Temperatures of the planetary nebula central stars tend to the extremes when compared to population I WR stars, so [WC2] and [WC3] are common and the sequence has been extended to [WC12]. The [WC11] and [WC12] types have distinctive spectra with narrow emission lines and no HeII and CIV lines. GK Persei (Nova Persei 1901), which showed Wolf Rayet features in its spectrum. Certain supernovae observed before their peak brightness show WR spectra. This is due to the nature of the supernova at this point: a rapidly expanding helium-rich ejecta similar to an extreme Wolf Rayet wind. The WR spectral features only last a matter of hours, the high ionisation features fading by maximum to leave only weak neutral hydrogen and helium emission, before being replaced with a traditional supernova spectrum. It has been proposed to label these spectral types with an "X", for example XWN5(h). Similarly, classical novae develop spectra consisting of broad emission bands similar to a Wolf Rayet star. This is caused by the same physical mechanism: rapid expansion of dense gases around an extremely hot central source. The separation of Wolf Rayet stars from spectral class O stars of a similar temperature depends on the existence of strong emission lines of ionised helium, nitrogen, carbon, and oxygen, but there are a number of stars with intermediate or confusing spectral features. For example, high luminosity O stars can develop helium and nitrogen in their spectra with some emission lines, while some WR stars have hydrogen lines, weak emission, and even absorption components. These stars have been given spectral types such as O3 If∗/WN6 and are referred to as slash stars. Another set of slash star spectral types is in use for Ofpe/WN stars. These stars have O supergiant spectra plus nitrogen and helium emission, and P Cygni profiles. Alternatively they can be considered to be WN stars with unusually low ionisation levels and hydrogen. The slash notation for these stars was controversial and an alternative was to extend the WR nitrogen sequence to WN10 and WN11 Other authors preferred to use the WNha notation, for example WN9ha for WR 108. A recent recommendation is to use an O spectral type such as O8Iaf if the 447.1 nm Hei line is in absorption and a WR class of WN9h or WN9ha if the line has a P Cygni profile. However, the Ofpe/WN slash notation as well as WN10 and WN11 classifications continue to be widely used. A third group of stars with spectra containing features of both O class stars and WR stars has been identified. Nine stars in the Large Magellanic Cloud have spectra that contain both WN3 and O3V features, but do not appear to be binaries. Many of the WR stars in the Small Magellanic Cloud also have very early WN spectra plus high excitation absorption features. It has been suggested that these could be a missing link leading to classical WN stars or the result of tidal stripping by a low-mass companion. The first three Wolf Rayet stars to be identified, coincidentally all with hot O companions, had already been numbered in the HD catalogue. These stars and others were referred to as Wolf–Rayet stars from their initial discovery but specific naming conventions for them would not be created until 1962 in the "fourth" catalogue of galactic Wolf Rayet stars. The first three catalogues were not specifically lists of Wolf Rayet stars and they used only existing nomenclature. The fourth catalogue numbered the Wolf Rayet stars sequentially in order of right ascension. The fifth catalogue used the same numbers prefixed with MR after the author of the fourth catalogue, plus an additional sequence of numbers prefixed with LS for new discoveries. Neither of these numbering schemes is in common use. The sixth Catalogue of Galactic Wolf Rayet stars was the first to actually bear that name, as well as to describe the previous five catalogues by that name. It also introduced the WR numbers widely used ever since for galactic WR stars. These are again a numerical sequence from WR 1 to WR 158 in order of right ascension. The seventh catalogue and its annex use the same numbering scheme and insert new stars into the sequence using lower case letter suffixes, for example WR 102ka for one of the numerous WR stars discovered in the galactic centre. Modern high volume identification surveys use their own numbering schemes for the large numbers of new discoveries. An IAU working group has accepted recommendations to expand the numbering system from the Catalogue of Galactic Wolf Rayet stars so that additional discoveries are given the closest existing WR number plus a numeric suffix in order of discovery. This applies to all discoveries since the 2006 annex, although some of these have already been named under the previous nomenclature; thus WR 42e is now numbered WR 42-1. Wolf Rayet stars in external galaxies are numbered using different schemes. 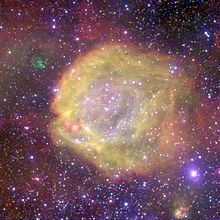 In the Large Magellanic Cloud, the most widespread and complete nomenclature for WR stars is from the fourth Catalogue of Population I Wolf Rayet stars in the Large Magellanic Cloud, prefixed by BAT-99, for example BAT-99 105. Many of these stars are also referred to by their third catalogue number, for example Brey 77. As of 2018, 154 WR stars are catalogued in the LMC, mostly WN but including about twenty-three WCs as well as three of the extremely rare WO class. Many of these stars are often referred to by their RMC (Radcliffe observatory Magellanic Cloud) numbers, frequently abbreviated to just R, for example R136a1. Wolf–Rayet stars are a normal stage in the evolution of very massive stars, in which strong, broad emission lines of helium and nitrogen ("WN" sequence), carbon ("WC" sequence), and oxygen ("WO" sequence) are visible. Due to their strong emission lines they can be identified in nearby galaxies. About 500 Wolf–Rayets are catalogued in our own Milky Way Galaxy. This number has changed dramatically during the last few years as the result of photometric and spectroscopic surveys in the near-infrared dedicated to discovering this kind of object in the Galactic plane. It is expected that there are fewer than 1,000 WR stars in the rest of the Local Group galaxies, with around 166 known in the Magellanic Clouds, 206 in M33, and 154 in M31. Outside the local group, whole galaxy surveys have found thousands more WR stars and candidates. For example, over a thousand WR stars have been detected in M101, from magnitude 21 to 25. WR stars are expected to be particularly common in starburst galaxies and especially Wolf–Rayet galaxies. The characteristic emission lines are formed in the extended and dense high-velocity wind region enveloping the very hot stellar photosphere, which produces a flood of UV radiation that causes fluorescence in the line-forming wind region. This ejection process uncovers in succession, first the nitrogen-rich products of CNO cycle burning of hydrogen (WN stars), and later the carbon-rich layer due to He burning (WC and WO-type stars). It can be seen that the WNh stars are completely different objects from the WN stars without hydrogen. Despite the similar spectra, they are much more massive, much larger, and some of the most luminous stars known. They have been detected as early as WN5h in the Magellanic clouds. The nitrogen seen in the spectrum of WNh stars is still the product of CNO cycle fusion in the core, but it appears at the surface of the most massive stars due to rotational and convectional mixing while still in the core hydrogen burning phase, rather than after the outer envelope is lost during core helium fusion. Some Wolf–Rayet stars of the carbon sequence ("WC"), especially those belonging to the latest types, are noticeable due to their production of dust. Usually this takes place on those belonging to binary systems as a product of the collision of the stellar winds forming the pair, as is the case of the famous binary WR 104; however this process occurs on single ones too. A few (roughly 10%) of the central stars of planetary nebulae are, despite their much lower (typically ~0.6 solar) masses, also observationally of the WR-type; i.e. they show emission line spectra with broad lines from helium, carbon and oxygen. Denoted [WR], they are much older objects descended from evolved low-mass stars and are closely related to white dwarfs, rather than to the very young, very massive population I stars that comprise the bulk of the WR class. These are now generally excluded from the class denoted as Wolf–Rayet stars, or referred to as Wolf–Rayet-type stars. The numbers and properties of Wolf Rayet stars vary with the chemical composition of their progenitor stars. A primary driver of this difference is the rate of mass loss at different levels of metallicity. Higher metallicity leads to high mass loss, which affects the evolution of massive stars and also the properties of Wolf Rayet stars. Higher levels of mass loss cause stars to lose their outer layers before an iron core develops and collapses, so that the more massive red supergiants evolve back to hotter temperatures before exploding as a supernova, and the most massive stars never become red supergiants. In the Wolf Rayet stage, higher mass loss leads to stronger depletion of the layers outside the convective core, lower hydrogen surface abundances and more rapid stripping of helium to produce a WC spectrum. These trends can be observed in the various galaxies of the local group, where metallicity varies from near-solar levels in the Milky Way, somewhat lower in M31, lower still in the Large Magellanic Cloud, and much lower in the Small Magellanic Cloud. Strong metallicity variations are seen across individual galaxies, with M33 and the Milky Way showing higher metallicities closer to the centre, and M31 showing higher metallicity in the disk than in the halo. Thus the SMC is seen to have few WR stars compared to its stellar formation rate and no WC stars at all (one star has a WO spectral type), the Milky Way has roughly equal numbers of WN and WC stars and a large total number of WR stars, and the other main galaxies have somewhat fewer WR stars and more WN than WC types. LMC, and especially SMC, Wolf Rayets have weaker emission and a tendency to higher atmospheric hydrogen fractions. SMC WR stars almost universally show some hydrogen and even absorption lines even at the earliest spectral types, due to weaker winds not entirely masking the photosphere. The maximum mass of a main-sequence star that can evolve through a red supergiant phase and back to a WNL star is calculated to be around 20 M☉ in the Milky Way, 32 M☉ in the LMC, and over 50 M☉ in the SMC. The more evolved WNE and WC stages are only reached by stars with an initial mass over 25 M☉ at near-solar metallicity, over 60 M☉ in the LMC. Normal single star evolution is not expected to produce any WNE or WC stars at SMC metallicity. Mass loss is influenced by a star's rotation rate, especially strongly at low metallicity. Fast rotation contributes to mixing of core fusion products through the rest of the star, enhancing surface abundances of heavy elements, and driving mass loss. Rotation causes stars to remain on the main sequence longer than non-rotating stars, evolve more quickly away from the red supergiant phase, or even evolve directly from the main sequence to hotter temperatures for very high masses, high metallicity or very rapid rotation. Stellar mass loss produces a loss of angular momentum and this quickly brakes the rotation of massive stars. Very massive stars at near-solar metallicity should be braked almost to a standstill while still on the main sequence, while at SMC metallicity they can continue to rotate rapidly even at the highest observed masses. Rapid rotation of massive stars may account for the unexpected properties and numbers of SMC WR stars, for example their relatively high temperatures and luminosities. Massive stars in binary systems can develop into Wolf Rayet stars due to stripping by a companion rather than inherent mass loss due to a stellar wind. This process is relatively insensitive to the metallicity or rotation of the individual stars and is expected to produce a consistent set of WR stars across all the local group galaxies. As a result, the fraction of WR stars produced through the binary channel, and therefore the number of WR stars observed to be in binaries, should be higher in low metallicity environments. Calculations suggest that the binary fraction of WR stars observed in the SMC should be as high as 98%, although less than half are actually observed to have a massive companion. The binary fraction in the Milky Way is around 20%, in line with theoretical calculations. AB7 produces one of the highest excitation nebulae in the Magellanic Clouds. A significant proportion of WR stars are surrounded by nebulosity associated directly with the star, not just the normal background nebulosity associated with any massive star forming region, and not a planetary nebula formed by a post-AGB star. The nebulosity presents a variety of forms and classification has been difficult. Many were originally catalogued as planetary nebulae and sometimes only a careful multi-wavelength study can distinguish a planetary nebula around a low mass post-AGB star from a similarly shaped nebula around a more massive core helium-burning star. A Wolf–Rayet galaxy is a type of starburst galaxy where a sufficient number of WR stars exist that their characteristic emission line spectra become visible in the overall spectrum of the galaxy. Specifically a broad emission feature due to the 468.6 nm Heii and nearby spectral lines is the defining characteristic of a Wolf–Rayet galaxy. The relatively short lifetime of WR stars means that the starbursts in such galaxies must have lasted less than a million years and occurred within the last few million years, or else the WR emission would be swamped by large numbers of other luminous stars. Theories about how WR stars form, develop, and die have been slow to form compared to the explanation of less extreme stellar evolution. They are rare, distant, and often obscured, and even into the 21st century many aspects of their lives are unclear. Although Wolf–Rayet stars have been clearly identified as an unusual and distinctive class of stars since the 19th century, the nature of these stars was uncertain until towards the end of the 20th century. By the 1960s it was clear that there were two very different groups of WR stars: luminous population I stars; and less luminous disc stars. The less luminous stars were associated with planetary nebulae and assumed to be mid-mass stars towards the end of the lives, but the evolutionary state of the population I stars was less clear. Their modest masses, high luminosities, and powerful stellar winds suggested that they were related to pre-main sequence stars such as T Tauri stars. Other astronomers, among them Rublev in 1965 and Conti in 1976 proposed that the WR stars as a class are descended from massive O-stars in which the strong stellar winds characteristic of extremely luminous stars have ejected the unprocessed outer H-rich layers. By the 1980s, the idea of population I WR stars as the descendants of massive class O stars was widely accepted and work was concentrated on how the O stars could evolve into WR stars and what happened next. The proposal that massive stars passed through a period of intense mass loss near the Eddington limit to the stability of luminous stars became established and is still largely accepted as the origin of most WR stars. Luminous blue variables (LBVs) were identified as likely candidates near the upper luminosity limit and showing this intense mass loss which strips away much of their outer layers of the star. The difference between WN or WR and the spectral sequences of each was thought to be an evolutionary sequence from cooler and more luminous WN stars towards hotter and less luminous WC stars, and ultimately WO stars. The endpoint of this evolution was even identified as a type Ib supernova although the correlation between models and observations showed a number of problems with the theory. The coolest and most luminous WN stars were eventually identified as a distinct class of objects comprising the most massive hydrogen-burning stars rather than post-main sequence evolved stars. Most WR stars, the classical population I type, are now understood as being a natural stage in the evolution of the most massive stars (not counting the less common planetary nebula central stars), either after a period as a red supergiant, after a period as a blue supergiant, or directly from the most massive main-sequence stars. Only the lower mass red supergiants are expected to explode as a supernova at that stage, while more massive red supergiants progress back to hotter temperatures as they expel their atmospheres. Some explode while at the yellow hypergiant or LBV stage, but many become Wolf Rayet stars. They have lost or burnt almost all of their hydrogen and are now fusing helium in their cores, or heavier elements for a very brief period at the end of their lives. Massive main-sequence stars create a very hot core which fuses hydrogen very rapidly via the CNO process and results in strong convection throughout the whole star. This causes mixing of helium to the surface, a process that is enhanced by rotation, possibly by differential rotation where the core is spun up to a faster rotation than the surface. Such stars also show nitrogen enhancement at the surface at a very young age, caused by changes in the proportions of carbon and nitrogen due to the CNO cycle. The enhancement of heavy elements in the atmosphere, as well as increases in luminosity, create strong stellar winds which are the source of the emission line spectra. These stars develop an Of spectrum, Of* if they are sufficiently hot, which develops into a WNh spectrum as the stellar winds increase further. This explains the high mass and luminosity of the WNh stars, which are still burning hydrogen at the core and have lost little of their initial mass. These will eventually expand into blue supergiants (LBVs?) as hydrogen at the core becomes depleted, or if mixing is efficient enough (e.g. through rapid rotation) they may progress directly to WN stars without hydrogen. WR stars are likely to end their lives violently rather than fade away to a white dwarf. Thus every star with an initial mass more than about 9 times the Sun would inevitably result in a supernova explosion, many of them from the WR stage. A simple progression of WR stars from low to hot temperatures, resulting finally in WO-type stars, is not supported by observation. WO-type stars are extremely rare and all the known examples are more luminous and more massive than the relatively common WC stars. Alternative theories suggest either that the WO-type stars are only formed from the most massive main-sequence stars, and/or that they form an extremely short-lived end stage of just a few thousand years before exploding, with the WC phase corresponding to the core helium burning phase and the WO phase to nuclear burning stages beyond. It is still unclear whether the WO spectrum is purely the result of ionisation effects at very high temperature, reflects an actual chemical abundance difference, or if both effects occur to varying degrees. Wolf–Rayet stars form from massive stars, although the evolved population I stars have lost half or more of their initial masses by the time they show a WR appearance. For example, γ2 Velorum A currently has a mass around 9 times the Sun, but began with a mass at least 40 times the Sun. High-mass stars are very rare, both because they form less often and because they have short lives. This means that Wolf–Rayet stars themselves are extremely rare because they only form from the most massive main-sequence stars and because they are a relatively short-lived phase in the lives of those stars. This also explains why type Ibc supernovae are less common than type II, since they result from higher-mass stars. WNh stars, spectroscopically similar but actually a much less evolved star which has only just started to expel its atmosphere, are an exception and still retain much of their initial mass. The most massive stars currently known are all WNh stars rather than O-type main-sequence stars, an expected situation because such stars show helium and nitrogen at the surface only a few thousand years after they form, possibly before they become visible through the surrounding gas cloud. An alternative explanation is that these stars are so massive that they could not form as normal main-sequence stars, instead being the result of mergers of less extreme stars. The difficulties of modelling the observed numbers and types of Wolf Rayet stars through single star evolution have led to theories that they form through binary interactions which could accelerate loss of the outer layers of a star through mass exchange. WR 122 is a potential example that has a flat disk of gas encircling the star, almost 2 trillion miles wide, and may have a companion star that stripped its outer envelope. It is widely suspected that many type Ib and type Ic supernova progenitors are WR stars, although no conclusive identification has been made of such a progenitor. Type Ib supernovae lack hydrogen lines in their spectra. The more common type Ic supernova lack both hydrogen and helium lines in their spectra. The expected progenitors for such supernova are massive stars that respectively lack hydrogen in their outer layers, or lack both hydrogen and helium. WR stars are just such objects. All WR stars lack hydrogen and in some WR stars, most notably the WO group, helium is also strongly depleted. WR stars are expected to experience core collapse when they have generated an iron core, and resulting supernova explosions would be of type Ib or Ic. In some cases it is possible that direct collapse of the core to a black hole would not produce a visible explosion. WR stars are very luminous due to their high temperatures but not visually bright, especially the hottest examples that are expected to make up most supernova progenitors. Theory suggests that the progenitors of type Ibc supernovae observed to date would not be bright enough to be detected, although they place constraints on the properties of those progenitors. One candidate is under observation as pre-outburst observations show a likely WR star at the site of iPTF13bvn,[clarification needed] although this is disputed. By far the most visible example of a Wolf–Rayet star is γ2 Velorum (WR 11), which is a bright naked eye star for those located south of 40 degrees northern latitude, although most of the light comes from an O7.5 giant companion. Due to the exotic nature of its spectrum (bright emission lines in lieu of dark absorption lines) it is dubbed the "Spectral Gem of the Southern Skies". The only other Wolf–Rayet star brighter than magnitude 6 is θ Muscae (WR 48), a triple star with two O class companions. Both are WC stars. The "ex" WR star WR 79a (HR 6272) is brighter than magnitude 6 but is now considered to be a peculiar O8 supergiant with strong emission. The next brightest at magnitude 6.4 is WR 22, a massive binary with a WN7h primary. The most massive and most luminous star currently known, R136a1, is also a Wolf–Rayet star of the WNh type that is still fusing hydrogen in its core. This type of star, which includes many of the most luminous and most massive stars, is very young and usually found only in the centre of the densest star clusters. Occasionally a runaway WNh star such as VFTS 682 is found outside such clusters, probably having been ejected from a multiple system or by interaction with other stars. HD 184738, also known as Campbell's Star. This is actually a planetary nebula and the central star is an old low-mass star unlike the main class of massive Wolf–Rayet stars. Only a minority of planetary nebulae have WR type central stars, but a considerable number of well-known planetary nebulae do have them. ^ Murdin, P. (2001). "Wolf, Charles J E (1827-1918)". The Encyclopedia of Astronomy and Astrophysics. p. 4101. Bibcode:2000eaa..bookE4101.. doi:10.1888/0333750888/4101. ISBN 978-0333750889. ^ Huggins, W.; Huggins, Mrs. (1890). "On Wolf and Rayet's Bright-Line Stars in Cygnus". Proceedings of the Royal Society of London. 49 (296–301): 33–46. doi:10.1098/rspl.1890.0063. ^ Fowler, A. (1912). "Hydrogen, Spectrum of, Observations of the principal and other series of lines in the". Monthly Notices of the Royal Astronomical Society. 73 (2): 62–105. Bibcode:1912MNRAS..73...62F. doi:10.1093/mnras/73.2.62. ^ Wright, W. H. (1914). "The relation between the Wolf–Rayet stars and the planetary nebulae". The Astrophysical Journal. 40: 466. Bibcode:1914ApJ....40..466W. doi:10.1086/142138. ^ a b Beals, C. S. (1929). "On the nature of Wolf–Rayet emission". Monthly Notices of the Royal Astronomical Society. 90 (2): 202–212. Bibcode:1929MNRAS..90..202B. doi:10.1093/mnras/90.2.202. ^ a b c Beals, C. S. (1940). "On the Physical Characteristics of the Wolf Rayet Stars and their Relation to Other Objects of Early Type (with Plates VIII, IX)". Journal of the Royal Astronomical Society of Canada. 34: 169. Bibcode:1940JRASC..34..169B. ^ Beals, C. S. (1933). "Classification and temperatures of Wolf–Rayet stars". The Observatory. 56: 196–197. Bibcode:1933Obs....56..196B. ^ Swings, P. (1942). "The Spectra of Wolf–Rayet Stars and Related Objects". The Astrophysical Journal. 95: 112. Bibcode:1942ApJ....95..112S. doi:10.1086/144379. ^ Starrfield, S.; Cox, A. N.; Kidman, R. B.; Pensnell, W. D. (1985). "An analysis of nonradial pulsations of the central star of the planetary nebula K1-16". Astrophysical Journal. 293: L23. Bibcode:1985ApJ...293L..23S. doi:10.1086/184484. ^ a b Sanduleak, N. (1971). "On Stars Having Strong O VI Emission". The Astrophysical Journal. 164: L71. Bibcode:1971ApJ...164L..71S. doi:10.1086/180694. ^ a b Barlow, M. J.; Hummer, D. G. (1982). "The WO Wolf–Rayet stars". Wolf–Rayet stars: Observations, physics, evolution; Proceedings of the Symposium, Cozumel, Mexico. 99. pp. 387–392. Bibcode:1982IAUS...99..387B. doi:10.1007/978-94-009-7910-9_51. ISBN 978-90-277-1470-1. ^ a b Smith, Nathan; Conti, Peter S. (2008). "On the Role of the WNH Phase in the Evolution of Very Massive Stars: Enabling the LBV Instability with Feedback". The Astrophysical Journal. 679 (2): 1467–1477. arXiv:0802.1742. Bibcode:2008ApJ...679.1467S. doi:10.1086/586885. ^ a b c d e f g h i j Sander, A.; Hamann, W.-R.; Todt, H. (2012). "The Galactic WC stars". Astronomy & Astrophysics. 540: A144. arXiv:1201.6354. Bibcode:2012A&A...540A.144S. doi:10.1051/0004-6361/201117830. ^ Beals, C. S. (1933). "Classification and temperatures of Wolf–Rayet stars". The Observatory. 56: 196. Bibcode:1933Obs....56..196B. ^ a b c d e f g h i j Van Der Hucht, Karel A. (2001). "The VIIth catalogue of galactic Wolf–Rayet stars". New Astronomy Reviews. 45 (3): 135–232. Bibcode:2001NewAR..45..135V. doi:10.1016/S1387-6473(00)00112-3. ^ a b c d e Crowther, P. A.; De Marco, O.; Barlow, M. J. (1998). "Quantitative classification of WC and WO stars". Monthly Notices of the Royal Astronomical Society. 296 (2): 367–378. Bibcode:1998MNRAS.296..367C. doi:10.1046/j.1365-8711.1998.01360.x. ISSN 0035-8711. ^ a b Smith, Lindsey F. (1968). "A revised spectral classification system and a new catalogue for galactic Wolf–Rayet stars". Monthly Notices of the Royal Astronomical Society. 138: 109–121. Bibcode:1968MNRAS.138..109S. doi:10.1093/mnras/138.1.109. ^ Crowther, P. A.; Smith, L. J. (1997). "Fundamental parameters of Wolf–Rayet stars. VI. Large Magellanic Cloud WNL stars". Astronomy and Astrophysics. 320: 500. Bibcode:1997A&A...320..500C. ^ Conti, Peter S.; Massey, Philip (1989). "Spectroscopic studies of Wolf–Rayet stars. IV - Optical spectrophotometry of the emission lines in galactic and large Magellanic Cloud stars". The Astrophysical Journal. 337: 251. Bibcode:1989ApJ...337..251C. doi:10.1086/167101. ^ a b c d Smith, L. F.; Michael m., S.; Moffat, A. F. J. (1996). "A three-dimensional classification for WN stars". Monthly Notices of the Royal Astronomical Society. 281: 163–191. Bibcode:1996MNRAS.281..163S. doi:10.1093/mnras/281.1.163. ^ Kingsburgh, R. L.; Barlow, M. J.; Storey, P. J. (1995). "Properties of the WO Wolf–Rayet stars". Astronomy and Astrophysics. 295: 75. Bibcode:1995A&A...295...75K. ISSN 0004-6361. ^ Smith, J. D. T.; Houck, J. R. (2001). "A Mid-Infrared Spectral Survey of Galactic Wolf–Rayet Stars". The Astronomical Journal. 121 (4): 2115–2123. Bibcode:2001AJ....121.2115S. doi:10.1086/319968. ^ a b c d Crowther, Paul A. (2007). "Physical Properties of Wolf–Rayet Stars". Annual Review of Astronomy and Astrophysics. 45: 177–219. arXiv:astro-ph/0610356. Bibcode:2007ARA&A..45..177C. doi:10.1146/annurev.astro.45.051806.110615. ^ Todt, H.; et al. (2010). "The central star of the planetary nebula PB 8: a Wolf–Rayet-type wind of an unusual WN/WC chemical composition". Astronomy and Astrophysics. 515: A83. arXiv:1003.3419. Bibcode:2010A&A...515A..83T. doi:10.1051/0004-6361/200912183. ^ Miszalski, B.; et al. (2012). "IC 4663: the first unambiguous [WN] Wolf–Rayet central star of a planetary nebula". Monthly Notices of the Royal Astronomical Society. 423: 934–947. arXiv:1203.3303. Bibcode:2012MNRAS.423..934M. doi:10.1111/j.1365-2966.2012.20929.x. ^ Todt, H.; et al. (2013). "Abell 48 - a rare WN-type central star of a planetary nebula". Monthly Notices of the Royal Astronomical Society. 430 (3): 2301–2312. arXiv:1301.1944. Bibcode:2013MNRAS.430.2302T. doi:10.1093/mnras/stt056. ^ Frew, David J.; et al. (2014). "The planetary nebula Abell 48 and its [WN] nucleus". Monthly Notices of the Royal Astronomical Society. 440 (2): 1345–1364. arXiv:1301.3994. Bibcode:2014MNRAS.440.1345F. doi:10.1093/mnras/stu198. ^ Hamann, W.-R. (1997). "Spectra of Wolf–Rayet type central stars and their analysis (Invited Review)". Proceedings of the 180th Symposium of the International Astronomical Union. Kluwer Academic Publishers. p. 91. Bibcode:1997IAUS..180...91H. ^ Hamann, Wolf-Rainer (1996). "Spectral analysis and model atmospheres of WR central stars (Invited paper)". Astrophysics and Space Science. 238: 31. Bibcode:1996Ap&SS.238...31H. doi:10.1007/BF00645489 (inactive 2018-07-29). ^ Liu, Q.-Z. ; Hu, J.-Y. ; Hang, H.-R.; Qiu, Y.-L.; Zhu, Z.-X. ; Qiao, Q.-Y. (2000). "The supernova 1998S in NGC 3877: Another supernova with Wolf–Rayet star features in pre-maximum spectrum" (PDF). Astronomy and Astrophysics Supplement Series. 144 (2): 219–225. Bibcode:2000A&AS..144..219L. doi:10.1051/aas:2000208. ^ Groh, Jose H. (2014). "Early-time spectra of supernovae and their precursor winds". Astronomy. 572: L11. arXiv:1408.5397. Bibcode:2014A&A...572L..11G. doi:10.1051/0004-6361/201424852. ^ a b c Crowther, Paul A.; Walborn, Nolan R. (2011). "Spectral classification of O2-3.5 If*/WN5-7 stars". Monthly Notices of the Royal Astronomical Society. 416 (2): 1311. arXiv:1105.4757. Bibcode:2011MNRAS.416.1311C. doi:10.1111/j.1365-2966.2011.19129.x. ^ Walborn, N. R. (1982). "The O3 stars". Astrophysical Journal. 254: L15. Bibcode:1982ApJ...254L..15W. doi:10.1086/183747. ^ Walborn, N. R. (1982). "Ofpe/WN9 circumstellar shells in the Large Magellanic Cloud". Astrophysical Journal. 256: 452. Bibcode:1982ApJ...256..452W. doi:10.1086/159922. ^ Smith, L. J.; Crowther, P. A.; Prinja, R. K. (1994). "A study of the luminous blue variable candidate He 3-519 and its surrounding nebula". Astronomy and Astrophysics. 281: 833. Bibcode:1994A&A...281..833S. ^ Crowther, P. A.; Bohannan, B. (1997). "The distinction between OIafpe and WNLha stars. 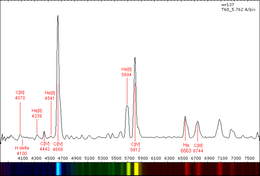 A spectral analysis of HD 151804, HD 152408 and HDE 313846". Astronomy and Astrophysics. 317: 532. Bibcode:1997A&A...317..532C. ^ Vamvatira-Nakou, C.; Hutsemékers, D.; Royer, P.; Cox, N. L. J.; Nazé, Y.; Rauw, G.; Waelkens, C.; Groenewegen, M. A. T. (2015). "The Herschel view of the nebula around the luminous blue variable star AG Carinae". Astronomy & Astrophysics. 578: A108. arXiv:1504.03204. Bibcode:2015A&A...578A.108V. doi:10.1051/0004-6361/201425090. ^ a b c Neugent, Kathryn F; Massey, Philip; Morrell, Nidia (2018). "A Modern Search for Wolf-Rayet Stars in the Magellanic Clouds. IV. A Final Census". arXiv:1807.01209 [astro-ph.SR]. ^ Roberts, M. S. (1962). "The galactic distribution of the Wolf–Rayet stars". The Astronomical Journal. 67: 79. Bibcode:1962AJ.....67...79R. doi:10.1086/108603. ^ Campbell, W. W. (1895). "Stars whose spectra contain both bright and dark hydrogen lines". The Astrophysical Journal. 2: 177. Bibcode:1895ApJ.....2..177C. doi:10.1086/140127. ^ Gaposchkin, Cecilia Payne (1930). The stars of high luminosity. Harvard Observatory Monographs. 3. p. 1. Bibcode:1930HarMo...3....1P. ^ Fleming, Williamina Paton Stevens; Pickering, Edward Charles (1912). "Stars having peculiar spectra". Annals of the Astronomical Observatory of Harvard College. 56: 165. Bibcode:1912AnHar..56..165F. ^ Van Der Hucht, Karel A.; Conti, Peter S.; Lundström, Ingemar; Stenholm, Björn (1981). "The Sixth Catalogue of galactic Wolf–Rayet stars, their past and present". Space Science Reviews. 28 (3): 227–306. Bibcode:1981SSRv...28..227V. doi:10.1007/BF00173260. ^ a b Van Der Hucht, K. A. (2006). "New Galactic Wolf–Rayet stars, and candidates". Astronomy and Astrophysics. 458 (2): 453–459. arXiv:astro-ph/0609008. Bibcode:2006A&A...458..453V. doi:10.1051/0004-6361:20065819. ^ a b Shara, Michael M.; Faherty, Jacqueline K.; Zurek, David; Moffat, Anthony F. J.; Gerke, Jill; Doyon, René; Artigau, Etienne; Drissen, Laurent (2012). "A Near-Infrared Survey of the Inner Galactic Plane for Wolf–Rayet Stars. Ii. Going Fainter: 71 More New W-R Stars". The Astronomical Journal. 143 (6): 149. arXiv:1106.2196. Bibcode:2012AJ....143..149S. doi:10.1088/0004-6256/143/6/149. ^ Rosslowe, C. K.; Crowther, P. A. (2015). "Spatial distribution of Galactic Wolf–Rayet stars and implications for the global population". Monthly Notices of the Royal Astronomical Society. 447 (3): 2322–2347. arXiv:1412.0699. Bibcode:2015MNRAS.447.2322R. doi:10.1093/mnras/stu2525. ^ Breysacher, J.; Azzopardi, M.; Testor, G. (1999). "The fourth catalogue of Population I Wolf–Rayet stars in the Large Magellanic Cloud". Astronomy and Astrophysics Supplement Series. 137: 117–145. Bibcode:1999A&AS..137..117B. doi:10.1051/aas:1999240. ^ Breysacher, J. (1981). "Spectral Classification of Wolf–Rayet Stars in the Large Magellanic Cloud". Astronomy and Astrophysics Supplement. 43: 203. Bibcode:1981A&AS...43..203B. ^ Hainich, R.; Rühling, U.; Todt, H.; Oskinova, L. M.; Liermann, A.; Gräfener, G.; Foellmi, C.; Schnurr, O.; Hamann, W.-R. (2014). "The Wolf–Rayet stars in the Large Magellanic Cloud. A comprehensive analysis of the WN class". Astronomy & Astrophysics. 565: A27. arXiv:1401.5474. Bibcode:2014A&A...565A..27H. doi:10.1051/0004-6361/201322696. ^ Azzopardi, M.; Breysacher, J. (1979). "A search for new Wolf–Rayet stars in the Small Magellanic Cloud". Astronomy and Astrophysics. 75: 120. Bibcode:1979A&A....75..120A. ^ Massey, Philip; Olsen, K. A. G.; Parker, J. Wm. (2003). "The Discovery of a 12th Wolf‐Rayet Star in the Small Magellanic Cloud". Publications of the Astronomical Society of the Pacific. 115 (813): 1265–1268. arXiv:astro-ph/0308237. Bibcode:2003PASP..115.1265M. doi:10.1086/379024. ^ Massey, Philip; Duffy, Alaine S. (2001). "A Search for Wolf‐Rayet Stars in the Small Magellanic Cloud". The Astrophysical Journal. 550 (2): 713–723. arXiv:astro-ph/0010420. Bibcode:2001ApJ...550..713M. doi:10.1086/319818. ^ Bonanos, A. Z.; Lennon, D. J.; Köhlinger, F.; Van Loon, J. Th. ; Massa, D. L.; Sewilo, M.; Evans, C. J.; Panagia, N.; Babler, B. L.; Block, M.; Bracker, S.; Engelbracht, C. W.; Gordon, K. D.; Hora, J. L.; Indebetouw, R.; Meade, M. R.; Meixner, M.; Misselt, K. A.; Robitaille, T. P.; Shiao, B.; Whitney, B. A. (2010). "Spitzersage-Smc Infrared Photometry of Massive Stars in the Small Magellanic Cloud". The Astronomical Journal. 140 (2): 416–429. arXiv:1004.0949. Bibcode:2010AJ....140..416B. doi:10.1088/0004-6256/140/2/416. ^ Shara, Michael M.; Moffat, Anthony F. J.; Gerke, Jill; Zurek, David; Stanonik, Kathryn; Doyon, René; Artigau, Etienne; Drissen, Laurent; Villar-Sbaffi, Alfredo (2009). "A Near-Infrared Survey of the Inner Galactic Plane for Wolf–Rayet Stars. I. Methods and First Results: 41 New Wr Stars". The Astronomical Journal. 138 (2): 402–420. arXiv:0905.1967. Bibcode:2009AJ....138..402S. doi:10.1088/0004-6256/138/2/402. ^ Neugent, Kathryn F.; Massey, Philip (2011). "The Wolf–Rayet Content of M33". The Astrophysical Journal. 733 (2): 123. arXiv:1103.5549. Bibcode:2011ApJ...733..123N. doi:10.1088/0004-637X/733/2/123. ^ Neugent, Kathryn F.; Massey, Philip; Georgy, Cyril (2012). "The Wolf–Rayet Content of M31". The Astrophysical Journal. 759: 11. arXiv:1209.1177. Bibcode:2012ApJ...759...11N. doi:10.1088/0004-637X/759/1/11. ^ Bibby, Joanne; Shara, M. (2012). "A Study of the Wolf–Rayet Population of M101 using the Hubble Space Telescope". American Astronomical Society. 219: #242.13. Bibcode:2012AAS...21924213B. ^ Schaerer, Daniel; Vacca, William D. (1998). "New Models for Wolf‐Rayet and O Star Populations in Young Starbursts". The Astrophysical Journal. 497 (2): 618–644. arXiv:astro-ph/9711140. Bibcode:1998ApJ...497..618S. doi:10.1086/305487. ^ Hamann, W.-R.; Gräfener, G.; Liermann, A. (2006). "The Galactic WN stars". Astronomy and Astrophysics. 457 (3): 1015–1031. arXiv:astro-ph/0608078. Bibcode:2006A&A...457.1015H. doi:10.1051/0004-6361:20065052. ^ Barniske, A.; Hamann, W.-R.; Gräfener, G. (2006). "Wolf–Rayet stars of the carbon sequence". ASP Conference Series. 353: 243. Bibcode:2006ASPC..353..243B. ^ a b c d Sander, Andreas A. C; Hamann, Wolf-Rainer; Todt, Helge; Hainich, Rainer; Shenar, Tomer; Ramachandran, Varsha; Oskinova, Lidia M (2018). "The Galactic WC and WO stars: The impact of revised distances from Gaia DR2 and their role as massive black hole progenitors". arXiv:1807.04293 [astro-ph.GA]. ^ Tylenda, R.; Acker, A.; Stenholm, B. (1993). "Wolf–Rayet Nuclei of Planetary Nebulae - Observations and Classification". Astronomy and Astrophysics Supplement. 102: 595. Bibcode:1993A&AS..102..595T. ^ a b Hainich, R.; Pasemann, D.; Todt, H.; Shenar, T.; Sander, A.; Hamann, W.-R. (2015). "Wolf–Rayet stars in the Small Magellanic Cloud. I. Analysis of the single WN stars". Astronomy & Astrophysics. 581: A21. arXiv:1507.04000. Bibcode:2015A&A...581A..21H. doi:10.1051/0004-6361/201526241. ISSN 0004-6361. ^ a b Toalá, J. A.; Guerrero, M. A.; Ramos-Larios, G.; Guzmán, V. (2015). "WISE morphological study of Wolf–Rayet nebulae". Astronomy & Astrophysics. 578: A66. arXiv:1503.06878. Bibcode:2015A&A...578A..66T. doi:10.1051/0004-6361/201525706. ^ Foellmi, C.; Moffat, A. F. J.; Guerrero, M. A. (2003). "Wolf–Rayet binaries in the Magellanic Clouds and implications for massive-star evolution – I. Small Magellanic Cloud". Monthly Notices of the Royal Astronomical Society. 338 (2): 360–388. Bibcode:2003MNRAS.338..360F. doi:10.1046/j.1365-8711.2003.06052.x. ^ Frew, David J.; Parker, Quentin A. (2010). "Planetary Nebulae: Observational Properties, Mimics and Diagnostics". Publications of the Astronomical Society of Australia. 27 (2): 129–148. arXiv:1002.1525. Bibcode:2010PASA...27..129F. doi:10.1071/AS09040. ^ Conti, Peter S.; Vacca, William D. (1994). "HST UV Imaging of the Starburst Regions in the Wolf–Rayet Galaxy He 2-10: Newly Formed Globular Clusters?". Astrophysical Journal Letters. 423: L97. Bibcode:1994ApJ...423L..97C. doi:10.1086/187245. ^ Leitherer, Claus; Vacca, William D.; Conti, Peter S.; Filippenko, Alexei V.; Robert, Carmelle; Sargent, Wallace L. W. (1996). "Hubble Space Telescope Ultraviolet Imaging and Spectroscopy of the Bright Starburst in the Wolf–Rayet Galaxy NGC 4214". Astrophysical Journal. 465: 717. Bibcode:1996ApJ...465..717L. doi:10.1086/177456. ^ Campbell, W. W. (1894). "The Wolf–Rayet stars". Astronomy and Astro-Physics (formerly the Sidereal Messenger). 13. Bibcode:1894AstAp..13..448C. ^ Underhill, Anne B. (1968). "The Wolf–Rayet Stars". Annual Review of Astronomy and Astrophysics. 6: 39–78. Bibcode:1968ARA&A...6...39U. doi:10.1146/annurev.aa.06.090168.000351. ^ Rublev, S. V. (1965). "Dynamic State of the Atmospheres of Wolf–Rayet Stars". Soviet Astronomy. 8: 848. Bibcode:1965SvA.....8..848R. ^ Conti, P. S. (1976). In: Mémoires de la Société royale des sciences de Liège (Proc. 20th Colloq. Int. Astrophys. Liège). 6-Sér. tome 9. Liége: Soc. r. sci. Liège. pp. 193–212. ^ Humphreys, R. M. (1991). "The Wolf–Rayet Connection - Luminous Blue Variables and Evolved Supergiants (review)". Proceedings of the 143rd Symposium of the International Astronomical Union. 143. p. 485. Bibcode:1991IAUS..143..485H. ^ Moffat, A. F. J.; Drissen, L.; Robert, C. (1989). "Observational Connections Between Lbv's and Other Stars, with Emphasis on Wolf–Rayet Stars". Physics of Luminous Blue Variables. Astrophysics and Space Science Library. 157. p. 229. doi:10.1007/978-94-009-1031-7_27. ISBN 978-94-010-6955-7. ^ Ensman, Lisa M.; Woosley, S. E. (1988). "Explosions in Wolf–Rayet stars and Type Ib supernovae. I - Light curves". Astrophysical Journal. 333: 754. Bibcode:1988ApJ...333..754E. doi:10.1086/166785. ^ Langer, N.; Hamann, W.-R.; Lennon, M.; Najarro, F.; Pauldrach, A. W. A.; Puls, J. (1994). "Towards an understanding of very massive stars. A new evolutionary scenario relating O stars, LBVs and Wolf–Rayet stars". Astronomy and Astrophysics. 290: 819. Bibcode:1994A&A...290..819L. ^ a b c d Groh, Jose H.; Meynet, Georges; Georgy, Cyril; Ekström, Sylvia (2013). "Fundamental properties of core-collapse supernova and GRB progenitors: Predicting the look of massive stars before death". Astronomy & Astrophysics. 558: A131. arXiv:1308.4681. Bibcode:2013A&A...558A.131G. doi:10.1051/0004-6361/201321906. ^ Georges Meynet; Cyril Georgy; Raphael Hirschi; Andre Maeder; Phil Massey; Norbert Przybilla; M-Fernanda Nieva (2011). "Red Supergiants, Luminous Blue Variables and Wolf–Rayet stars: The single massive star perspective". Bulletin de la Société Royale des Sciences de Liège. v1. 80 (39): 266–278. arXiv:1101.5873. Bibcode:2011BSRSL..80..266M. ^ Tramper, Frank (2013). "The nature of WO stars: VLT/X-Shooter spectroscopy of DR1". Massive Stars: from α to Ω: 187. arXiv:1312.1555. Bibcode:2013msao.confE.187T. ^ a b Eldridge, John J.; Fraser, Morgan; Smartt, Stephen J.; Maund, Justyn R.; Crockett, R. Mark (2013). "The death of massive stars - II. Observational constraints on the progenitors of Type Ibc supernovae". Monthly Notices of the Royal Astronomical Society. 436: 774–795. arXiv:1301.1975. Bibcode:2013MNRAS.436..774E. doi:10.1093/mnras/stt1612. ^ Groh, Jose; Meynet, Georges; Ekstrom, Sylvia; Georgy, Cyril (2014). "The evolution of massive stars and their spectra I. A non-rotating 60 Msun star from the zero-age main sequence to the pre-supernova stage". Astronomy & Astrophysics. 564: A30. arXiv:1401.7322. Bibcode:2014A&A...564A..30G. doi:10.1051/0004-6361/201322573. ^ Oberlack, U.; Wessolowski, U.; Diehl, R.; Bennett, K.; Bloemen, H.; Hermsen, W.; Knödlseder, J.; Morris, D.; Schönfelder, V.; von Ballmoos, P. (2000). "COMPTEL limits on 26Al 1.809 MeV line emission from gamma2 Velorum". Astronomy and Astrophysics. 353: 715. arXiv:astro-ph/9910555. Bibcode:2000A&A...353..715O. ^ Banerjee, Sambaran; Kroupa, Pavel; Oh, Seungkyung (2012). "The emergence of super-canonical stars in R136-type starburst clusters". Monthly Notices of the Royal Astronomical Society. 426 (2): 1416–1426. arXiv:1208.0826. Bibcode:2012MNRAS.426.1416B. doi:10.1111/j.1365-2966.2012.21672.x. ^ Mauerhan, Jon C.; Smith, Nathan; Van Dyk, Schuyler D.; Morzinski, Katie M.; Close, Laird M.; Hinz, Philip M.; Males, Jared R.; Rodigas, Timothy J. (2015). "Multiwavelength Observations of NaSt1 (WR 122): Equatorial Mass Loss and X-rays from an Interacting Wolf–Rayet Binary". Monthly Notices of the Royal Astronomical Society. 1502 (3): 1794. arXiv:1502.01794. Bibcode:2015MNRAS.450.2551M. doi:10.1093/mnras/stv257. ^ Dessart, Luc; Hillier, D. John; Livne, Eli; Yoon, Sung-Chul; Woosley, Stan; Waldman, Roni; Langer, Norbert (2011). "Core-collapse explosions of Wolf–Rayet stars and the connection to Type IIb/Ib/Ic supernovae". Monthly Notices of the Royal Astronomical Society. 414 (4): 2985. arXiv:1102.5160. Bibcode:2011MNRAS.414.2985D. doi:10.1111/j.1365-2966.2011.18598.x. ^ Groh, Jose H.; Georgy, Cyril; Ekström, Sylvia (2013). "Progenitors of supernova Ibc: A single Wolf–Rayet star as the possible progenitor of the SN Ib iPTF13bvn". Astronomy & Astrophysics. 558: L1. arXiv:1307.8434. Bibcode:2013A&A...558L...1G. doi:10.1051/0004-6361/201322369. ^ Fremling, C.; Sollerman, J.; Taddia, F.; Ergon, M.; Valenti, S.; Arcavi, I.; Ben-Ami, S.; Cao, Y.; Cenko, S. B.; Filippenko, A. V.; Gal-Yam, A.; Howell, D. A. (2014). "The rise and fall of the Type Ib supernova iPTF13bvn. Not a massive Wolf–Rayet star". Astronomy & Astrophysics. 565: A114. arXiv:1403.6708. Bibcode:2014A&A...565A.114F. doi:10.1051/0004-6361/201423884. ^ Acker, A.; Neiner, C. (2003). "Quantitative classification of WR nuclei of planetary nebulae". Astronomy and Astrophysics. 403 (2): 659–673. Bibcode:2003A&A...403..659A. doi:10.1051/0004-6361:20030391. ^ Peña, M.; Rechy-García, J. S.; García-Rojas, J. (2013). "Galactic kinematics of Planetary Nebulae with [WC] central star". Revista Mexicana de Astronomía y Astrofísica. 49: 87. arXiv:1301.3657. Bibcode:2013RMxAA..49...87P. Tuthill, Peter G.; Monnier, John D.; Danchi, William C.; Turner, Nils H. (2003). "High-resolution near-IR imaging of the WCd(+OB) environments: Pinwheels". Proceedings of the 212th International Union of Astronomy Symposium. 212. p. 121. Bibcode:2003IAUS..212..121T. Monnier, J. D.; Tuthill, P. G.; Danchi, W. C. (1999). "Pinwheel Nebula around WR 98[CLC]a[/CLC]". The Astrophysical Journal. 525 (2): L97. arXiv:astro-ph/9909282. Bibcode:1999ApJ...525L..97M. doi:10.1086/312352. PMID 10525463. Dougherty, S. M.; Beasley, A. J.; Claussen, M. J.; Zauderer, B. A.; Bolingbroke, N. J. (2005). "High-Resolution Radio Observations of the Colliding-Wind Binary WR 140". The Astrophysical Journal. 623: 447–459. arXiv:astro-ph/0501391. Bibcode:2005ApJ...623..447D. doi:10.1086/428494. 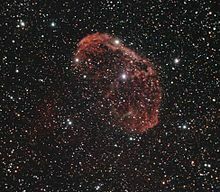 Wikimedia Commons has media related to Wolf-Rayet stars.